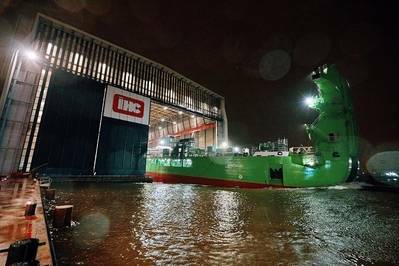 On November 10, Royal IHC successfully launched the Spartacus, a 44,180kW self-propelled cutter suction dredger (CSD) designed and built for DEME. The ceremony took place at IHC's shipyard in Krimpen aan den IJssel, The Netherlands. It was performed by Mrs Fabienne Ackermans, the spouse of Mr Luc Bertrand (chairman of the Board of Directors of Ackermans & van Haaren, owner of DEME). Spartacus is reportedly the world’s largest CSD and the first to be powered by liquefied natural gas (LNG). The four main engines can run on LNG, marine diesel oil (MDO) and heavy fuel oil (HFO). The two auxiliary engines also incorporate dual-fuel technology. IHC and DEME acquired extensive knowledge during the build of LNG-powered trailing suction hopper dredgers MINERVA and SCHELDT RIVER. In addition to the use of LNG as fuel, Spartacus features several additional innovations, such as a waste heat recovery system, a one-man operated dredge control and a heavy-duty cutter ladder that can reach a dredging depth of 45m.